WTOP film critic Jason Fraley said the Lego gimmick is starting to wear thin in the fourth installment. 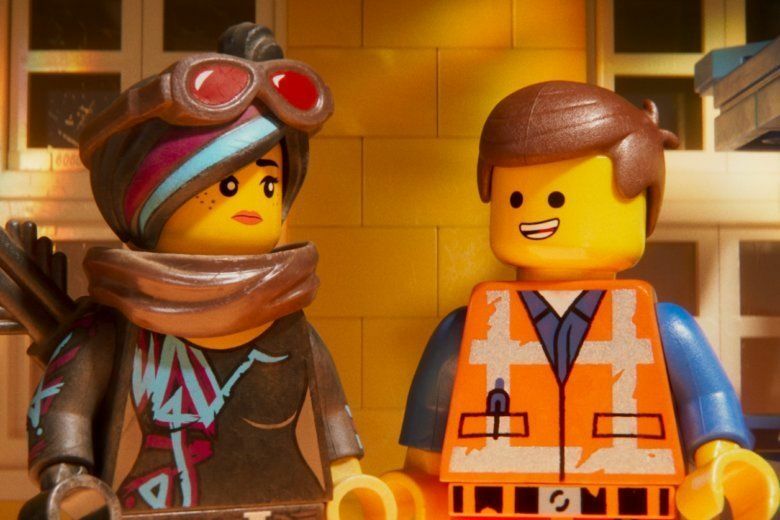 WASHINGTON — In one of the most “awesome” surprises in recent Hollywood memory, “The Lego Movie” overcame its potential product placement pitfalls to deliver a fresh, hilarious, animated pop-culture romp that became one of the Top 5 highest-grossing movies of 2014. It was only a matter of time before sequels followed, including this weekend’s release of “The Lego Movie 2: The Second Part,” a misleading title since it’s actually the fourth installment of the franchise after “The Lego Batman Movie” (2017) and “The Lego Ninjago Movie” (2017). Visionary creators Phil Lord and Christopher Miller return to write the script for Warner Bros. in a welcome career rebound attempt after infamously being replaced by Ron Howard mid-production on Disney’s “Solo: A Star Wars Story” (2018) due to reported creative differences. It’s only fitting that their new animated plot involves space invaders threatening to wreck Lego Land. Set five years after the events of the first film, optimistic construction worker Emmet Brickowski (Chris Pratt) endures a somber shift from Bricksburg to Apocalypseburg upon an alien invasion. When loved ones Lucy (Elizabeth Banks), Batman (Will Arnett), Benny (Charlie Day) and Unikitty (Alison Brie) are taken hostage for an intergalactic wedding, Emmet sets out to rescue them with the help of his brash new sidekick Rex Dangervest (also voiced by Pratt). Still, the real show-stealer remains Arnett’s Batman, who is so dunce and brooding that it’s impossible not to laugh. “They’ve made roughly nine movies about me,” he brags, referencing his Adam West tights, George Clooney charm and Val Kilmer lips. Much of the humor lies in his shameless moral malleability, changing opinions about himself in hilariously pathetic attempts to woo the disingenuous alien villain Queen Watevra Wa-Nabi (Tiffany Haddish). Haddish’s shape-shifting seductress is the best part of the movie, mixing the Cheshire Cat from “Alice in Wonderland” (1951), Kaa from “The Jungle Book” (1967), Ursula from “The Little Mermaid” (1989) and Tamatoa from “Moana” (2016). Here she belts two sneaky numbers, one proclaiming all the ways that she is not evil (even though we know she is) and another about her affection for the Man of Steel (even though she’s just trying to make Batman jealous). Superman (Channing Tatum) is one of the many holdovers from the first film, from Gandalf (Todd Hansen) to the Green Lantern (Jonah Hill) to Abraham Lincoln (Will Forte). Pop culture references abound from “Back to the Future” (1985) to “Die Hard” (1988), but in the aftermath of “Ready Player One” (2018), I worry that filmmakers and audiences are both starting to believe that the frequency of movie references is enough to constitute a good movie. Quite the contrary, they’re plastic masks to cover up derivative material that can’t stand on its own. The same goes for the soundtrack, featuring the all-too-common classic rock selections (i.e. Motley Crue’s “Kickstart My Heart”) that have become so fashionable since “Guardians.” At least there’s a fresh new ear worm, the aptly titled “Catchy Song” by T-Pain and That Girl Lay Lay, featuring the accurate refrain: “This song will get stuck in your head.” It’s this sequel’s version of Tegan and Sara’s “Everything is Awesome,” which earned an Oscar nomination for Best Original Song, losing to John Legend and Common’s “Glory” duet from “Selma” (2014). The music desperately tries to keep up with animation director Trisha Gum, who delivers the brand’s painstaking computer graphics patterned after actual Lego sets. This unique visual design sadly wasn’t enough to earn an Oscar nomination for Best Animated Film in 2014, perhaps because voters went in hoping for true stop-motion (i.e. “Fantastic Mr. Fox” and “Isle of Dogs”). After all, Legos would have been the perfect fit for the tangible technique — we used to do it as kids on VHS camcorders — so I’ve always viewed it as a missed opportunity. At this point, the Lego gimmick is starting to wear thin, despite the efforts of director Mike Mitchell, who also made “Trolls” (might Chia Pets be next?). The entire exercise feels like we’re watching a Saturday morning cartoon aimed at a hyperactive kid. Fittingly, like the first movie, a framing device reveals the animated action to be controlled by two live-action kids, whose parents are lovably played by Maya Rudolph on screen and Will Ferrell yelling off screen. If anything, I found myself wanting to spend more time out in the real world like “Toy Story” (1995) and less time inside the zany world of make believe. This is what made the “Toy Story” franchise so prolific: our ability to identify with the toys in the real world setting. There’s only so much time we can spend inside an animated block world without getting a headache. The 2014 original was better as a one-time surprise that no one saw coming, rather than a building block for an entire franchise. In the grand scheme, film history won’t remember a fourth installment of an animated film based on a children’s toy brand, but in an isolated week-to-week vacuum, it might be enough for a mindless family trip to the movie theater. Just know that if “everything was awesome” the first time, everything is now just average.